An ambitious County Durham technology business has set up its first technical apprenticeship to help ensure it has the skills required to support its continuing growth. 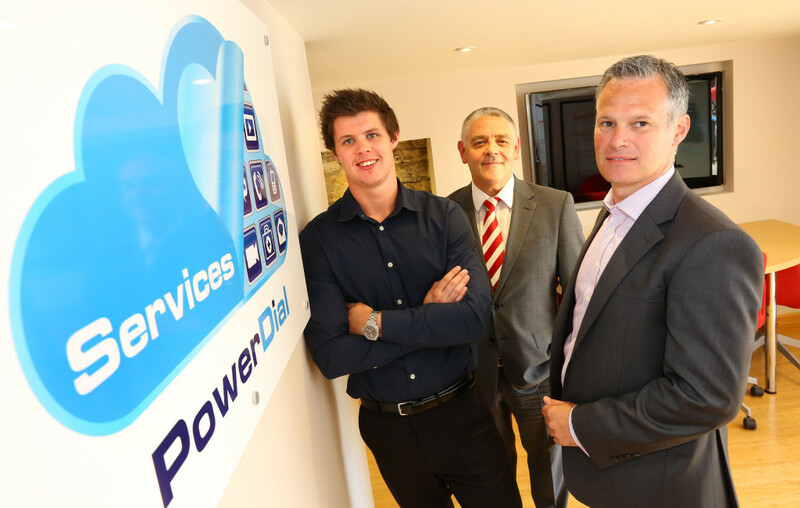 Powerdial Services is a provider of business collaboration and ICT solutions and services to dozens of well-known national and international brands, as well as many others across the North East, and has achieved more than 40% year-on-year revenue increase over the last 12 months, as well as increasing staff numbers by 30% during the same period. Local 18 year-old Adam Rutherford has now joined the Seaham-headquartered firm as its first technical apprentice, and is undertaking an on-the-job training programme that will eventually lead to him becoming a qualified IT Technician with accreditations from technology giants Microsoft, Cisco and Avaya. Powerdial has also recently launched its own hosted voice solution (HVS) under the Powerdial Connect brand, in order to consolidate their position in the fast-growing ‘cloud voice’ market, where customers’ communications are cloud-based rather than premises based. And the management team has also praised the positive impact of a six figure investment secured from the Finance for Business North East Growth Fund on the speed of its evolution. Powerdial worked with regional fund management firm NEL Fund Managers to secure the Growth Fund investment in late 2014, which was brought in to cover the growth capital requirements of its business plan. The new technical apprenticeship programme is running alongside its existing financial apprenticeship programme, and Paul Farn, Powerdial’s managing director and co-owner, is encouraging other regional businesses to make full use of the IT skills that local young people have to offer. He says: “No matter what level of academic achievement young people leave education with today, they’re all far better equipped to utilise business related technology than previous generations could have dreamed of. “North East businesses should be making the most of the opportunities this presents for both themselves and these young people, and we’ve created our new technical apprenticeship with doing just that in mind. “Powerdial’s workforce has now grown to 17, with more jobs expected to be created as a result of its continuing growth, and it is about to deploy its first cloud-based multi-channel contact centre into one of the UK’s largest corporate contact centres. “Much of our success has been built on supplying technologies that physically sit within clients’ premises, and whilst we will to continue to supply these solutions, there is an increasing trend for cloud-based voice services which negates the need for any major upfront investment. “Industry analysts suggest that upwards of 30,000 new cloud voice connections are being made across the UK every month, and that hosted voice solutions will make up about half of the SME market by 2025, so we’re launching our new solutions to put ourselves in the best position to take advantage of these trends. “Our new solution negates the need for upfront capital investment and includes a market leading package of features, handsets and shared call time that virtually eradicates telephone call costs. “Over the last two years, our relationship with the NEL team has been great, and we regard them as business partners who are just as interested in our success as we are. Established by holding fund manager North East Finance (NEF) in 2010, the £159.5m Finance for Business North East (FBNE) programme is a suite of seven venture capital and loan funds which provide investment for start-up and growing businesses in the North East of England. They will continue investing until 2016, and aim to support 950 companies and to create or safeguard almost 10,000 jobs. A new £4m extension to the Finance For Business North East Growth Fund was recently confirmed, and NEL is actively looking to speak to more North East businesses about securing investment from it to help them put development plans into action. For more information about NEL’s investment criteria, visit www.nel.co.uk or contact the investment team on 0345 369 7007. Registered office: NEL Fund Managers Limited, 4 Enterprise House, Kingsway, Team Valley, NE11 0SR. Company Registration Number: 2564907. Registered in England. NEL Fund Managers Limited is authorised and regulated in the UK by the Financial Conduct Authority. Copyright © 2019 NEL Fund Managers Limited. Website by Mitchweb. All rights reserved.